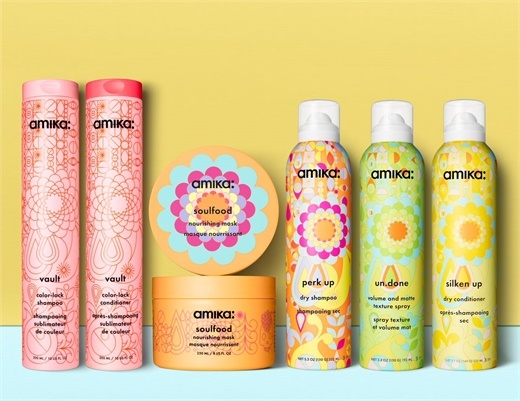 Brooklyn-based hair brand amika will reveal a full relaunch of its product packaging. The brand’s vibrant signature pattern remains intact throughout the line, but all products will now be categorized by principal benefit and color codified in custom bottles that will make it simple for hair stylists and consumers alike to identify products within the collection. All existing formulas remain unchanged, however some products will receive an updated name to better communicate their best usage. The packaging relaunch will better reflect amika's brand aesthetic and mission for a lifestyle of self-expression and hair rebellion against conformity and the mundane. The entirety of the packaging relaunch was designed in-house by amika’s Creative Director, Vita Raykhman. Several products underwent name changes to better exemplify the key benefit or final result—such as with The Shield Style Extending Spray, which transformed into The Shield Anti-Humidity Spray, or Un.Done Texture Spray, retitled to Un.Done Volume & Matte Texture Spray. The products are separated into nine collections designated by primary usage— Signature, Curl, Repair, Color, Blonde, Smooth, Texture, Volume and Hold—each with a distinctive color scheme to identify the category.